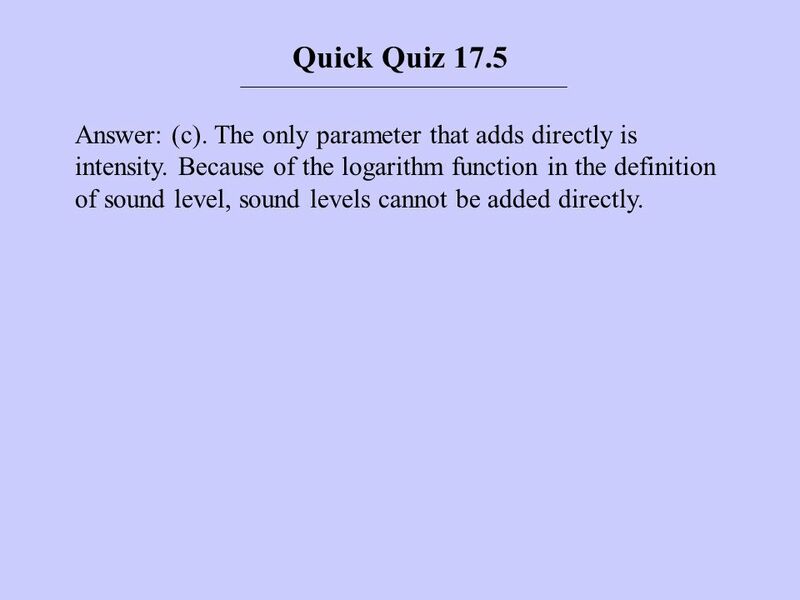 3 Quick Quiz 17.1 Answer: (c). Although the speed of a wave is given by the product of its wavelength (a) and frequency (b), it is not affected by changes in either one. The amplitude (d) of a sound wave determines the size of the oscillations of elements of air but does not affect the speed of the wave through the air. 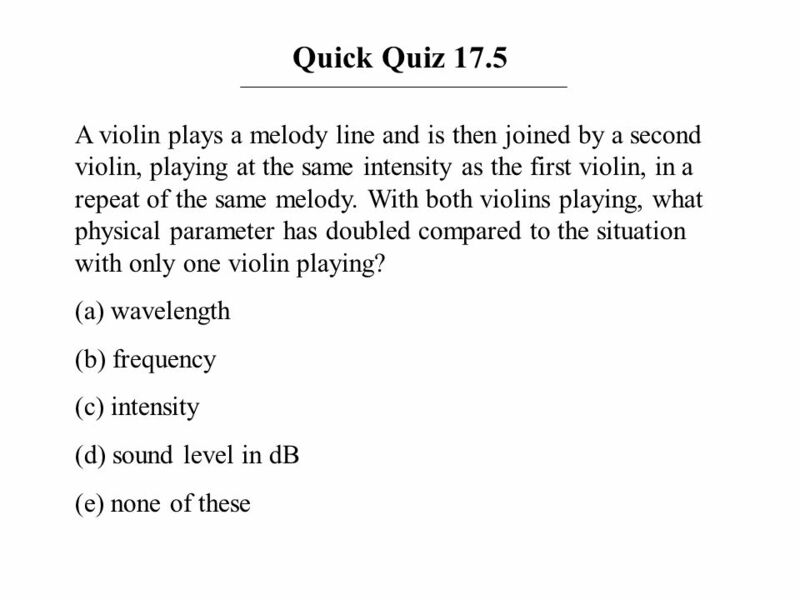 5 Quick Quiz 17.2 Answer: (c). 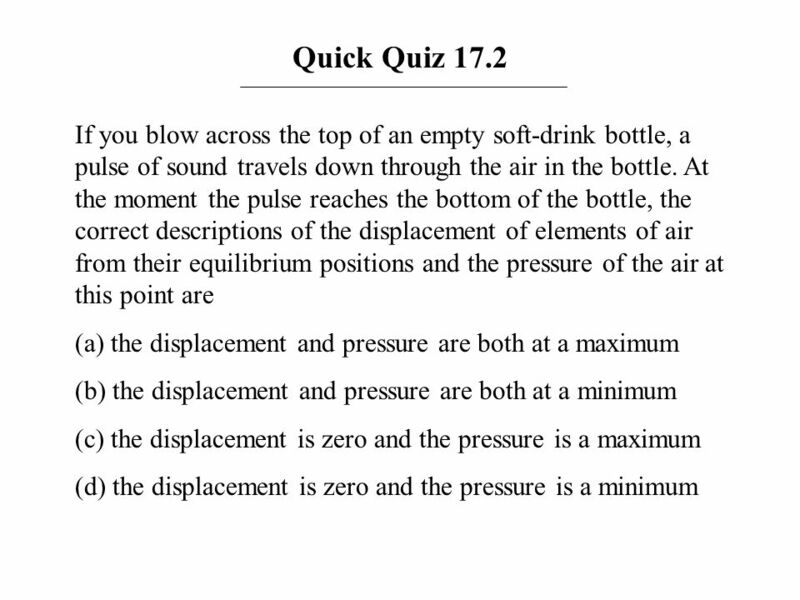 Because the bottom of the bottle is a rigid barrier, the displacement of elements of air at the bottom is zero. 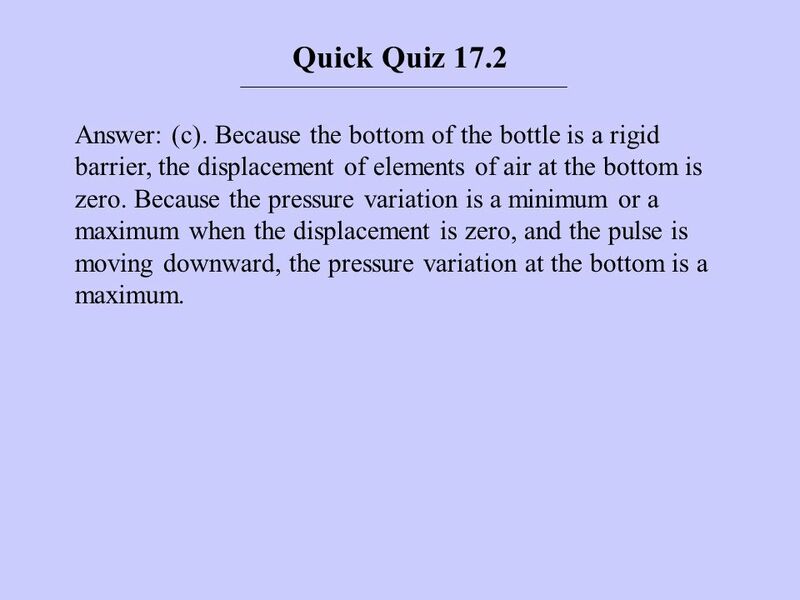 Because the pressure variation is a minimum or a maximum when the displacement is zero, and the pulse is moving downward, the pressure variation at the bottom is a maximum. 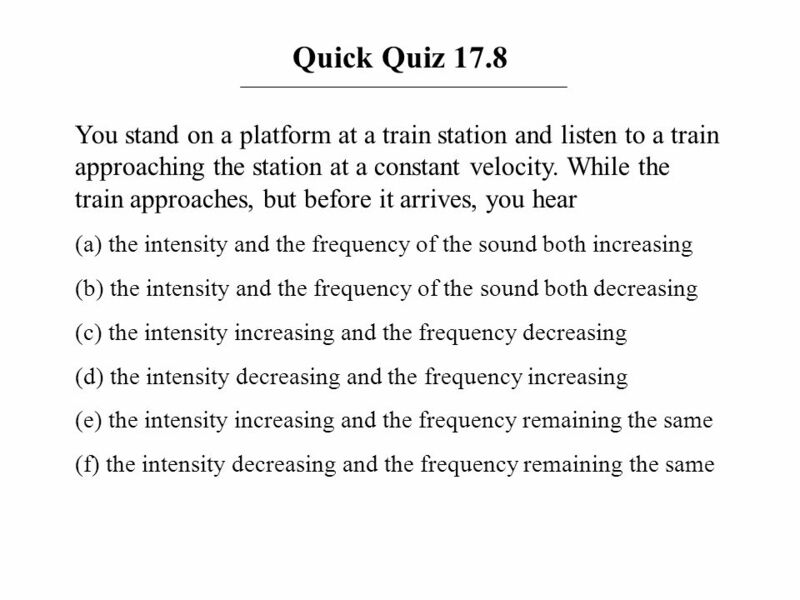 7 Quick Quiz 17.3 Answer: (c). 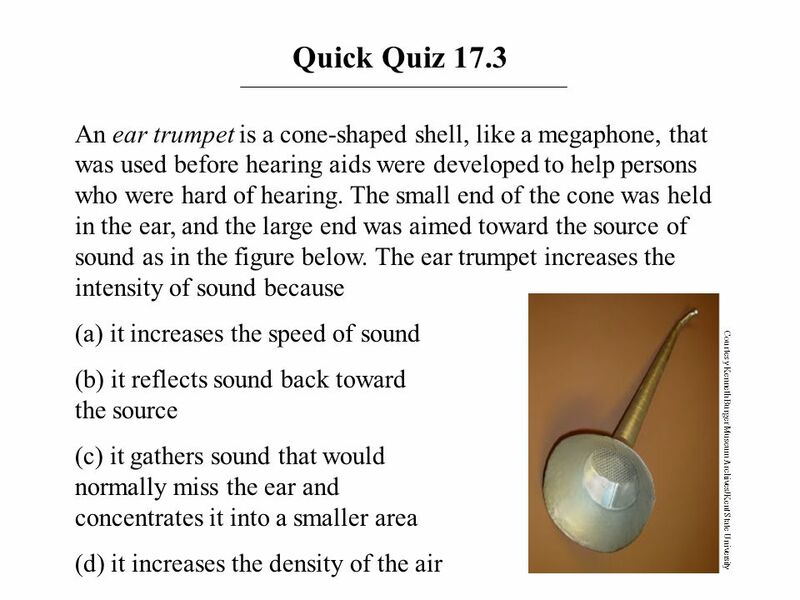 The ear trumpet collects sound waves from the large area of its opening and directs it toward the ear. 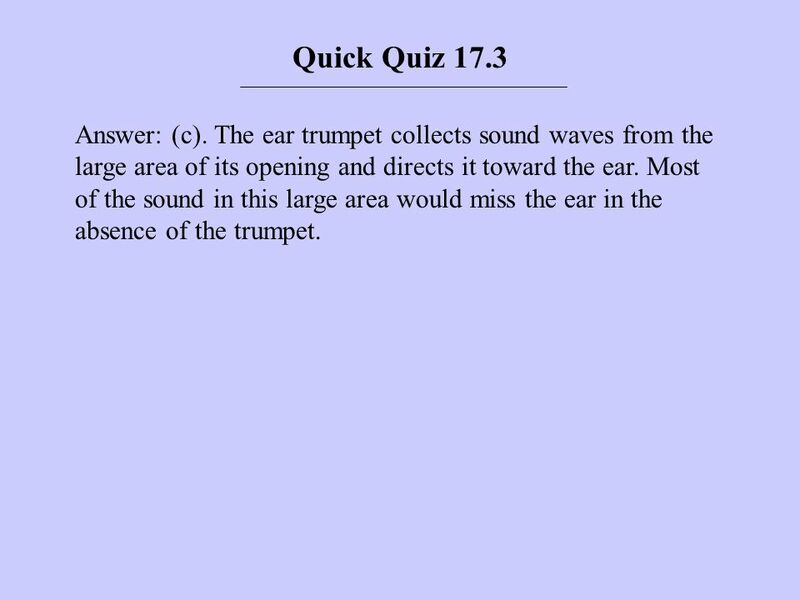 Most of the sound in this large area would miss the ear in the absence of the trumpet. 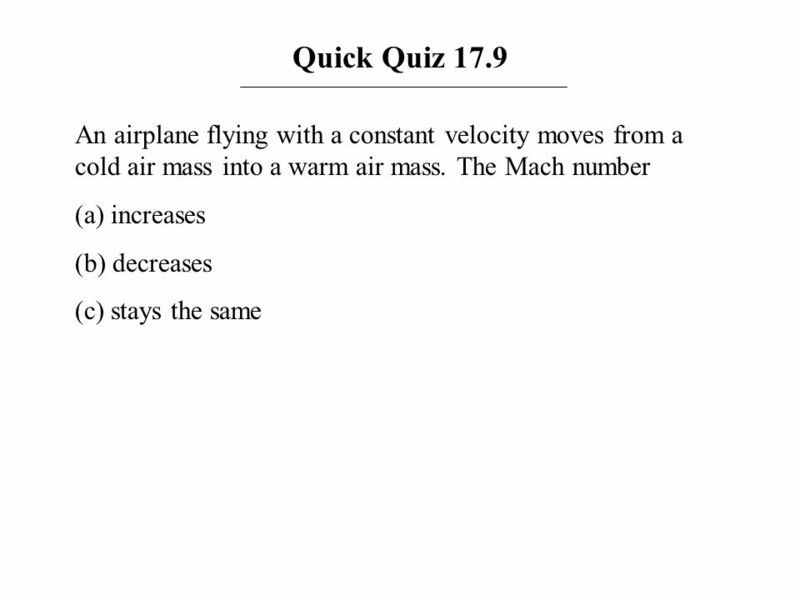 9 Quick Quiz 17.4 Answer: (b). 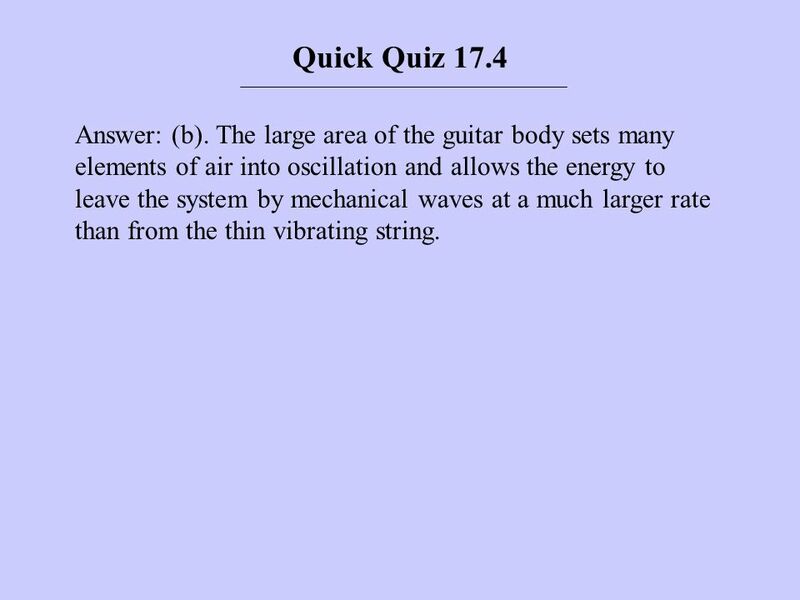 The large area of the guitar body sets many elements of air into oscillation and allows the energy to leave the system by mechanical waves at a much larger rate than from the thin vibrating string. 11 Quick Quiz 17.5 Answer: (c). The only parameter that adds directly is intensity. 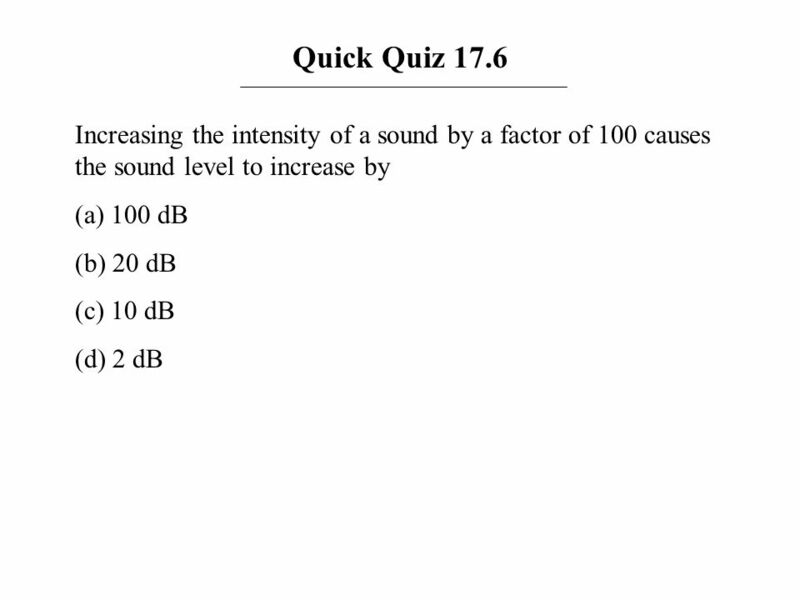 Because of the logarithm function in the definition of sound level, sound levels cannot be added directly. 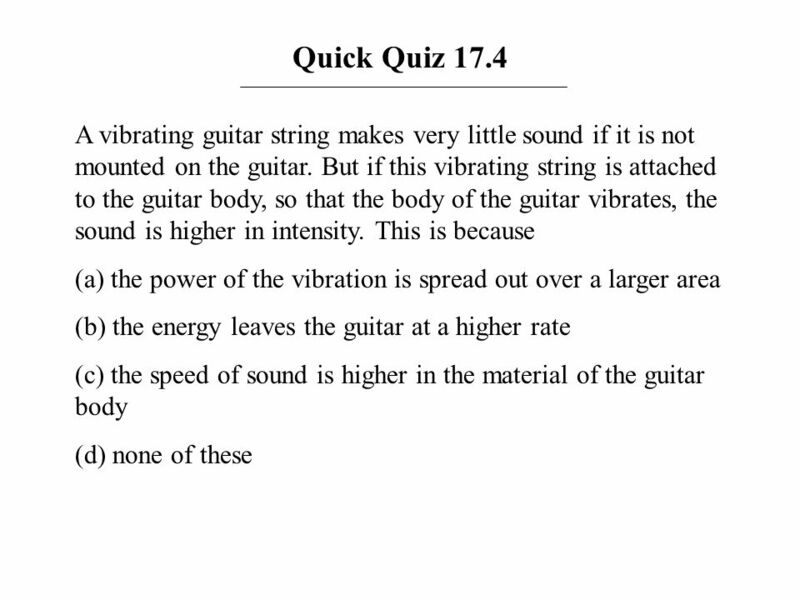 13 Quick Quiz 17.6 Answer: (b). The factor of 100 is two powers of ten. Thus, the logarithm of 100 is 2, which multiplied by 10 gives 20 dB. 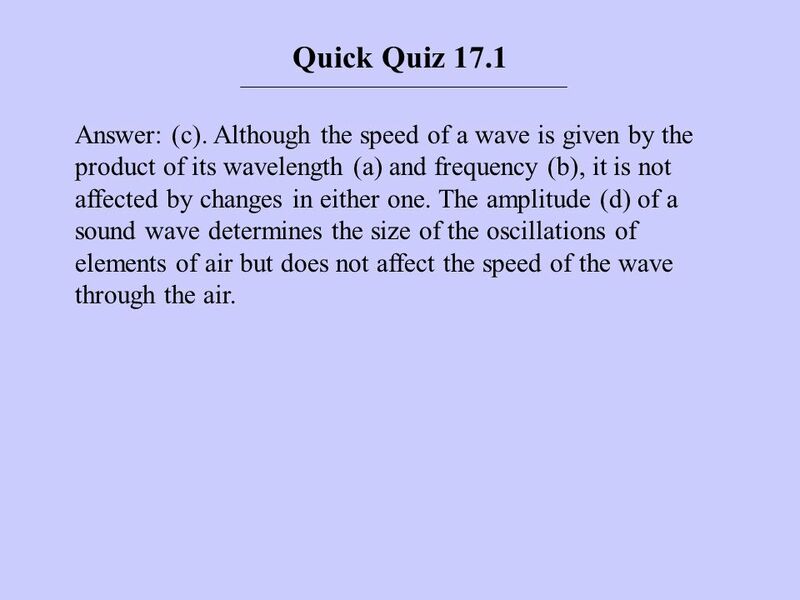 15 Quick Quiz 17.7 Answer: (e). The wave speed cannot be changed by moving the source, so (a) and (b) are incorrect. The detected wavelength is largest at A, so (c) and (d) are incorrect. 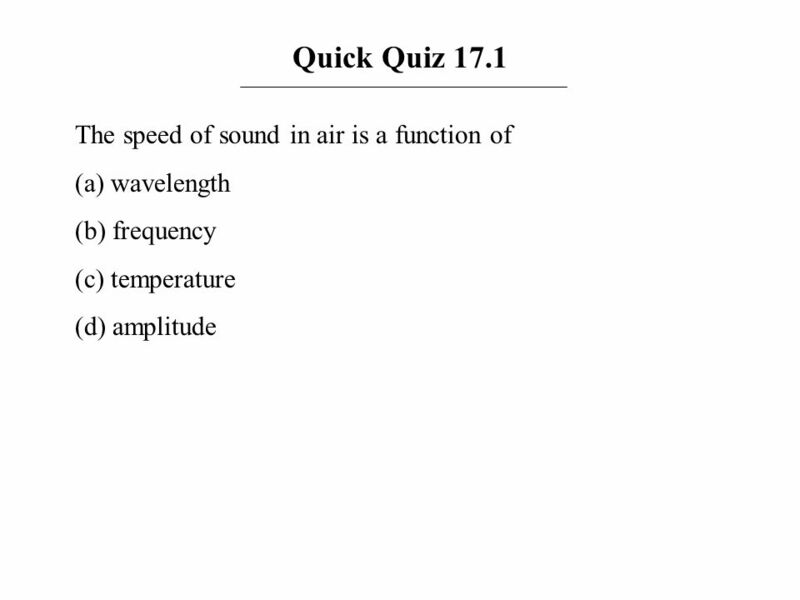 Choice (f) is incorrect because the detected frequency is lowest at location A. 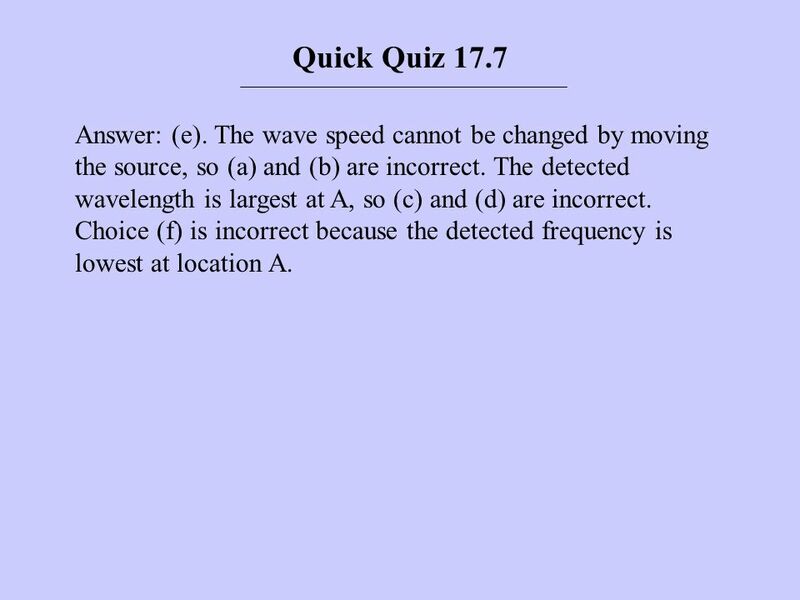 17 Quick Quiz 17.8 Answer: (e). The intensity of the sound increases because the train is moving closer to you. 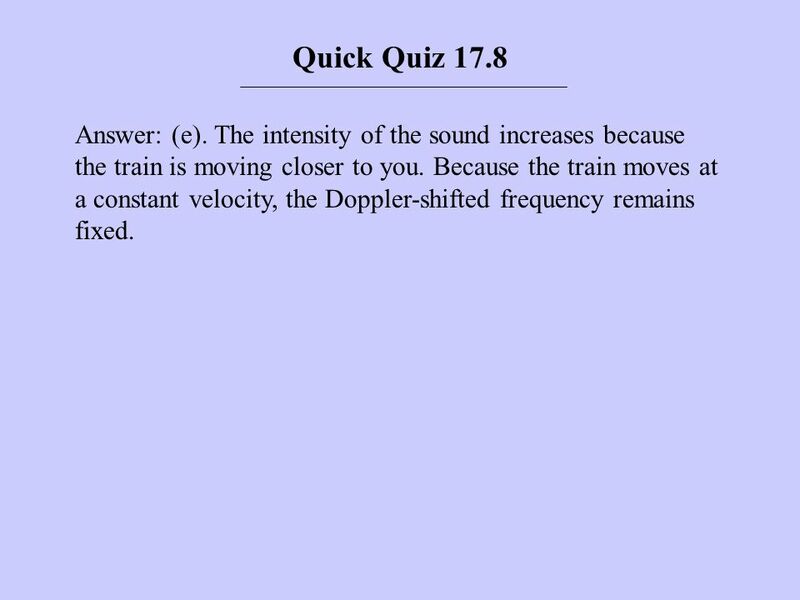 Because the train moves at a constant velocity, the Doppler-shifted frequency remains fixed. 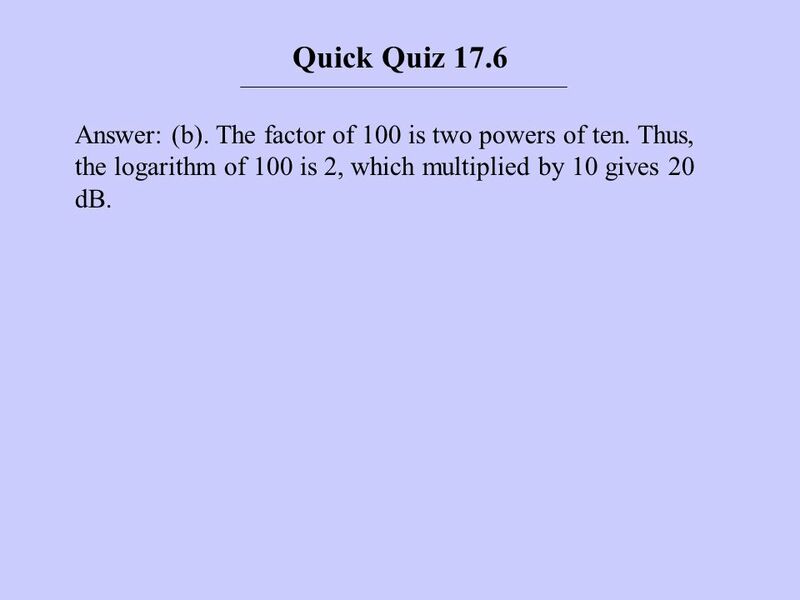 19 Quick Quiz 17.9 Answer: (b). 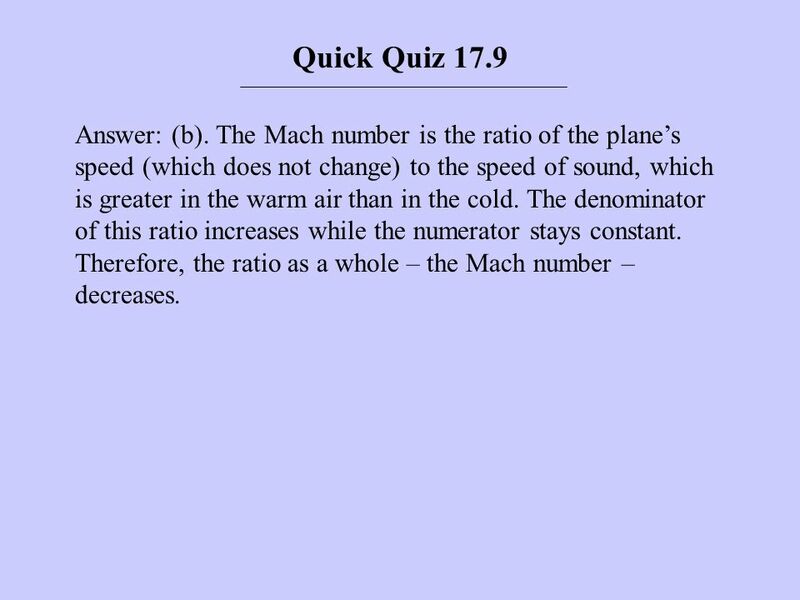 The Mach number is the ratio of the plane’s speed (which does not change) to the speed of sound, which is greater in the warm air than in the cold. The denominator of this ratio increases while the numerator stays constant. Therefore, the ratio as a whole – the Mach number – decreases. 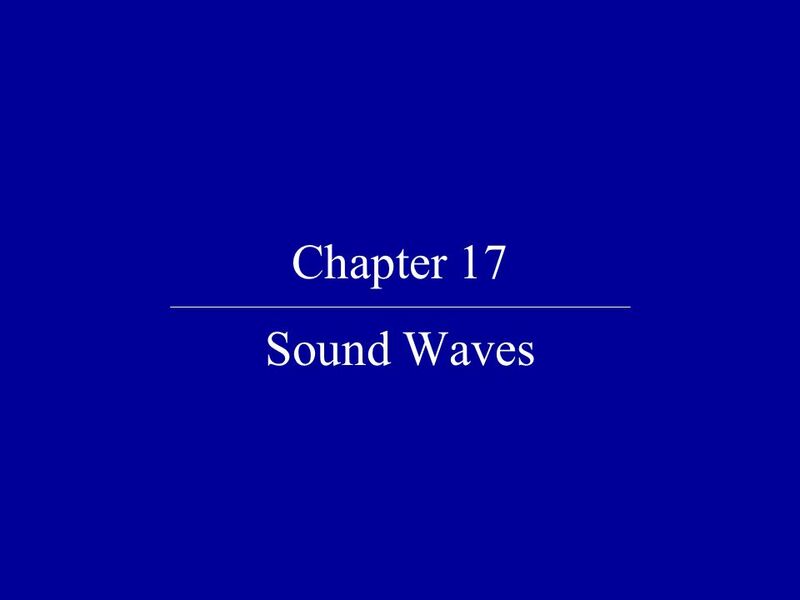 Download ppt "Chapter 17 Sound Waves." From Table 17.1, it is apparent that the speed of sound is significantly greater (by roughly a factor of 10) in solids than in gases. This significant. ConcepTest 11.16Out to Sea ConcepTest Out to Sea t t +  t 1) 1 second 2) 2 seconds 3) 4 seconds 4) 8 seconds 5) 16 seconds A boat is moored in a. 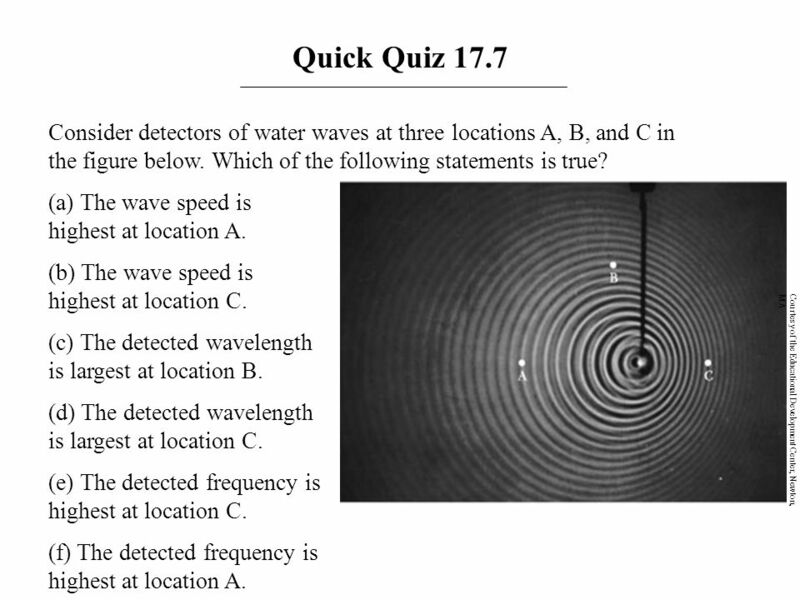 Physics for Scientists and Engineers, 6e Chapter 17 – Sound Waves. Summary Sinusoidal wave on a string Wavefunction.